It’s summer on the Gaviota Coast. The green hills that sprouted during our much-needed winter rains have turned to gold and brown. The seal pups grew up and have moved on. And the Gaviota Coast Conservancy has been busier than ever on a variety of issues. our view that it is long past the time to close the landfill at Tajiguas, as such an industrial activity is inappropriate for the Gaviota Coast and it is certainly not good policy to develop additional industrial activities such as the anaerobic digestion process. We are committed to working with others to create a 21st-century approach to managing waste in the Santa Barbara region that is on the cutting edge of sustainability practice, and to work to restore Tajiguas to a positive role in the coastal ecosystem. Many of you may have seen Shaw Leonard’s movie Gaviota: The End of Southern California when it was shown at the Santa Barbara International Film Festival and more recently at the Sandbox. The movie is a terrific exploration of the natural history of the Gaviota Coast. If you haven’t seen it or you want to see it again, more showings are coming up. In most cases, we are showing the film in conjunction with the movie Losing Ground: Gaviota, a UCSB Blue Horizons student film featuring GCC Board member Guner Tautrim and his efforts to promote more sustainable agriculture practices on his family’s Gaviota Coast ranch and to encourage his neighbors’ efforts. We're excited about our new membership program, and invite you to join (if you haven't already). Thanks for participating with us! Follow us on Facebook, Twitter and Instagram for updates and invitations. We offer occasional guided hikes onto the Naples property and select other sites on the Gaviota Coast. Sign up to be on the Hikes Email List and we’ll let you know about the next opportunities to explore a part of the nearby Gaviota Coast up close. Many thanks to Steven Tiller, Macy McGinness and the staff of SeaVees shoes of Santa Barbara for their significant and very generous annual 1% For The Planet donation to Gaviota Coast Conservancy. We are proud and honored to have them as a partner in the 1% For The Planet program. SeaVees has again shown their commitment to protecting the rural character and environmental integrity of the Gaviota Coast and the Central Coast region. We're deeply grateful to SeaVees for their continued support and look forward to a long and rewarding relationship, including hikes and fun like the gathering held recently with board members and SeaVees staff at Naples. You guys are the best! Tajiguas Resource Recovery Project "Dead in the Water"
(Santa Barbara, CA, April 24, 2017) Leaders at the Gaviota Coast Conservancy (GCC) disclosed today that the County of Santa Barbara Solid Waste Division’s Tajiguas Resource Recovery Project (TRRP) has been halted indefinitely, due to a major land use processing error committed by the County. In 1999, the Board of Supervisors directed County staff to close Tajiguas Landfill by 2015. Rather than adopting aggressive source reduction and better recycling programs and closing the landfill, County staff sought approval for a high-tech $120M trash processing plant on the Gaviota Coast. The Santa Barbara County Board of Supervisors approved the TRRP in July, 2016. “At various times throughout this process, we asked whether specific elements of the Project were in the coastal zone and subject to permit, but the County just modified the project and we never got a complete answer. A trash processing plant is a bad idea anywhere on the Gaviota Coast. This is a biodiverse region of global significance, whose natural and cultural resources qualify it as suitable to be a National Seashore. It should not house a garbage dump at all, much less be the location for a massive new industrial trash processing facility,” explained GCC’s attorney, Marc Chytilo. The Project proponents ignored the state-designated coastal zone boundary, relying instead on the County’s map, and discovered their error only after the EIR was complete, the project was approved, and the County was seeking $120M in public financing for the project. “Gaviota Coast Conservancy has opposed trucking, processing, and dumping trash on the Gaviota Coast. It’s simply the wrong place for these industrial activities. We need to do better at reducing the amount of trash we generate, and to sort out valuable commodities, including organic waste. New State law requires communities to separate organic waste and prohibits dumping it in landfills. Organic food waste can easily be composted, using green waste to produce clean compost in large quantities that can help sequester carbon in soils and increase agricultural viability on the South Coast. The remaining trash residuals can be disposed in a new state-of-the-art landfill outside of Santa Maria, using the new electric trucks or highly efficient liquefied natural gas, like what is now being used in Ventura County. Tajiguas Landfill should be closed for good,” explained one of GCC’s founding Board members, Mike Lunsford. The County asked the Coastal Commission to adjust the boundary, and was rejected when the Commission concluded that the County’s submittal “patently fails” to meet the legal requirements. The County has limited options, and as approved, the project is dead. The Gaviota Coast is recognized as a recreational resource of statewide importance and has natural and cultural resources that make the Gaviota Coast suitable for National Seashore designation. It is a globally significant biodiversity hot spot, home to 1400 different species. Its visual features and landscapes are stunning, leading to Caltrans’ 2016 designation of Highway 101 through the Gaviota Coast as a California Scenic Highway. Only a small fraction of the Gaviota Coast’s lands are permanent protected, however, so action is needed to accomplish permanent protection as the forces of development and industrialization grow ever-stronger. The TRRP is a $120M trash processing project that the County of Santa Barbara’s Solid Waste Division has proposed to site at the Tajiguas Landfill on the Gaviota Coast. Originally the project was to be privately financed by the Project operators, Mustang Investments, but Mustang later asked the County to finance the project. The total projected project cost, with financing, is GaviotaCoastConservancy.org Dedicated to protecting the rural character and environmental integrity of the Gaviota Coast for present and future generations $200M. The TRRP would consolidate trash processing activities to the Gaviota Coast. Gaviota Coast Conservancy opposes the TRRP because it is a very expensive high tech solution that extends trash processing on the Gaviota Coast for decades when less expensive, simpler and more flexible alternatives exist. In 1999, the Board of Supervisors directed County staff to close the Tajiguas Landfill within 15 years, but staff instead sought to extend its life and perpetuate incompatible industrial activities on the Gaviota Coast. The TRRP commits our community to increased trash rates (nearly 15% over next 2 years and 40% over next 10 years), and discourages the development of stand-alone, high quality composting facilities that are needed for local farms and to enable Carbon Farming, an important tool for sequestering carbon in the soil. the remaining residual is disposed at the new Las Flores Ranch Class III Landfill near Santa Maria using efficient, electric-powered or alternatively-fueled haul trucks. The County staff was apparently unaware that the state coastal zone boundary differed from the boundary on County maps, and that the state boundary always controls. Significant parts of the TRRP are actually located inside the coastal zone. Prior approvals of the TRRP are now invalid. The County’s initial request to modify the coastal zone boundary was summarily rejected. The County now faces a daunting process to try to gain approval of the TRRP. f) Direct staff to proceed with all short-term options including a benchfill project and a minor fill project in the Coastal Zone at the Tajiguas Landfill site. a) Conducted public hearing and considered the long-term, intermediate and short-term refuse disposal strategies. b) Approved. Directed staff to modify the project description to reflect the goal that the Tajiguas Landfill be closed within 15 years or sooner. Venoco's declaration of filing for Chapter 11 bankruptcy and returning of three offshore state leases back to the State of California is great news for the Gaviota Coast! Since their leases include Platform Holly and wells drilled at the beach at Ellwood, this is also a welcome development to neighbors in the City of Goleta. “This action by Venoco signals the end of oil production and processing from State waters on the Gaviota Coast,” stated Michael S. Brown, President of the Gaviota Coast Conservancy. The rupture of the All-American Pipeline at Refugio in May 2015 and its continued non-operation led to a shutdown of Venoco’s Platform Holly offshore of the Gaviota Coast and of Exxon’s Las Flores Canyon processing operations in the heart of the Gaviota Coast. The Gaviota Coast Conservancy has advocated for the elimination of industrial activities on the Gaviota Coast, including oil and gas development and processing, as well as solid waste management. The shutdown, removal, and remediation of Venoco’s onshore facilities opens new opportunities for public use of a portion of the Coast that has been off limits for more than half a century. “While the termination of Venoco’s operations in state waters is an important and positive development, the federal Department of Interior has signaled it may seek to reopen the Santa Barbara Channel and other areas to new federal leasing for oil drilling. The Conservancy and our environmental colleagues will maintain our vigilance over the Gaviota Coast and forcefully oppose any such proposals,” explained Mr. Brown. In an urgent Message from the Office of Emergency Management: An Evacuation Warning has been issued for the greater Sherpa Fire Burn area by the Santa Barbara County Sheriff Department beginning 4 am Sunday. The Santa Barbara Independent covered the floods at El Capitan Canyon on January 20 that washed away five cabins and 15 cars, with more photos here in the story by Noozhawk. The LA Times has more photos, and the Santa Maria Times has video with rescue workers and gushing water. Here's more video from January 20 at El Capitan Canyon. People in the cabins and campground were rescued with a tracked vehicle, with tank-like treads. In addition, the historic Orella adobes suffered extensive damage. Gaviota Coast Conservancy board member and descendant of the Presidio founder who built those homes, Guner Tautrim, shared his view from Orella Ranch on January 20, "Today was crazy!! We didn't experience the insane rain fall amounts or intensity but we sure suffered the effects of it. At my place we only measured 2" of rain total (all day) versus the 2" in an hour at Bobby's place. All that upslope rain on the fire-scarred terrain reeked havoc down here. El Cap is totally destroyed. Way way way worse then the fires. Carnage all up the canyon. And Corral Canyon - Las Floras (Exxon Mobil) got a major flushing as well. Sadly the historic Ortega adobes (my great-great-great-grandfather's house) got destroyed. A pile of debris. Venadito Canyon is pretty damaged as well, with lots of mud, blocked culverts and the like. To think more is coming is pretty scary." Fellow Gaviota Coast resident Bobby Hazard reported on January 20, "Checking the County auto rain gauge at the top of the pass, we had 3 inches between 7 and 10pm, but 1.9 inches in one hour from 8-9. Amazing; it's never happened in my 40 years up here. The creek looks completely different in many places. As with many such things, there is a silver lining. Our springs are flowing after years of not and my neighbor's well has 30 feet more water in it than before. The creek that was choked with invasive growth is cleaned out and open to the sun. And Refugio Beach has lots of new sand." 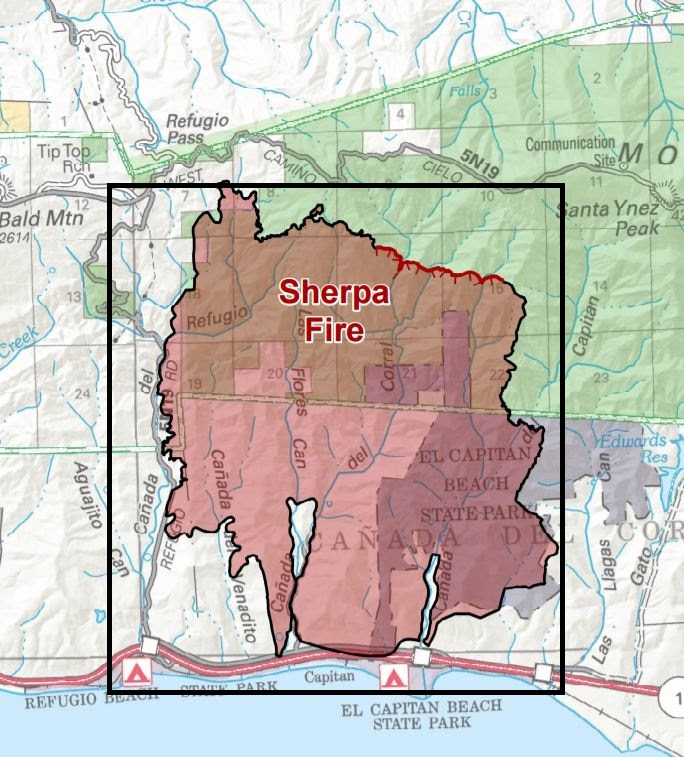 Following winter weather warnings from the National Weather Service for Santa Barbara County, an evacuation warning has been issued from the Santa Barbara County Sheriff for areas burned in the Sherpa Fire (June 2016) including El Capitan Canyon, El Capitan Ranch, El Capitan State Beach, Refugio State Beach, Refugio Canyon, Canada Venadito Canyon, del Coral, and Las Flores Canyon (see enclosed map). The warning is in place for Sunday, January 22 beginning at 4 a.m.
An evacuation warning means there is a strong likelihood that there will be a risk to life and property, and residents in the warning area should take this time to prepare to leave quickly if given a mandatory evacuation order. Time should be taken to gather family members, pets, valuables, and important paperwork/documents. An individual or family should be ready to leave at a moment’s notice. However, if anyone feels threatened, do not wait for an evacuation order – leave immediately. In addition, advisories issued today from the National Weather Service include a high wind warning in place through Monday, January 23, and a flash flood watch on Sunday, January 22 from the early morning until the afternoon for all areas of Santa Barbara County, not just the burn areas. El Capitan and Refugio state parks are currently closed, as well as the northbound Hwy 101 off ramp at El Capitan. The public is encouraged to avoid going out in the storm and to stay off the roads. As a precaution, do not walk through flood waters. It only takes six inches of moving water to knock you off your feet. If you are trapped by moving water, move to the highest possible point and call 911 for help. Do not drive into flooded roadways or around a barricade. Water may be deeper than it appears and can hide many hazards, such as sharp objects, washed out road surfaces, electrical wires, chemicals, etc. A vehicle caught in swiftly moving water can be swept away in a matter of seconds. Twelve inches of water can float a car or small SUV and 18 inches of water can carry away large vehicles. For updated information, visit www.countyofsb.org. Residents and visitors are strongly encouraged to sign up for “Aware and Prepare” alerts at www.awareandprepare.org. The Santa Barbara County Emergency Operations Center has been activated as well as the Joint Information Center to provide county residents and visitors with updated information regarding flash flooding and debris flow hazards. Caltrans has officially designed the Gaviota Coast as a State Scenic Highway. Over the past year, Gaviota Coast Conservancy worked tirelessly with Caltrans, County staff and the Santa Barbara Board of Supervisors to make this happen. As stated by the Director of Caltrans, "the scenic qualities of this well-deserved section of California's coast will be preserved, so that they may continue to be appreciated and enjoyed by all." Gaviota Coast Conservancy, along with Supervisor Doreen Farr, have long pushed for this overdue designation. The new Scenic Highway will extend along a 21-mile stretch of Highway 101, from Goleta's western boundary to Highway 1 at Las Cruces, where it will connect with another scenic route on Highway 1 between Las Cruces and Lompoc. For more detail, here's an article on the Gaviota Coast Scenic Highway designation in the Lompoc Record. Your Gaviota Coast Conservancy board continues to work diligently to help preserve the Gaviota Coast. This is one more step in that pursuit. We are most proud and pleased to have taken a leading role in this project, and look forward to continuing our work in the coming year. There will be a formal dedication in the near future. We will keep you informed, when the date is set. Today there are two active development proposals on the historic Naples townsite. Between Paradiso’s two lots and the Santa Barbara Ranch project, lie 57 acres with 25 substandard “Naples Townsite” lots. Owned by the Paradiso developers and formerly the western end of the Arco-Dos Pueblos Golf Course, the lands are bounded by Cañada Tomate and the Paradiso project to the east, Highway 101 to the north, the Santa Barbara Ranch fence line to the west, and the Pacific Ocean to the south. Developers propose to build seven large houses on these lands – four between the ocean and the railroad, and three between the railroad and Highway 101. These former oilfield lands have high quality habitat that includes wetlands, native grasslands, white-tailed kites and grasshopper sparrows. The entire site is visually prominent when you are traveling along Highway 101 and the railroad. The CBAR (Central Board of Architectural Review) conceptually reviewed the developer’s preliminary designs for the seven proposed homes earlier this year. If you drive by the site, you’ll see that the developer is currently drilling shallow wells to test septic system suitability. The project’s full development application is expected to be submitted to the County in early 2017. It will be a two- to three-year process that will include preparation of an EIR, a public comment period, and County processing of permits through the Planning Commission, Board of Supervisors and Coastal Commission. Gaviota Coast Conservancy and its ally, Surfrider Foundation, will scrutinize every detail of this project at every step of the way to prevent inappropriate development in this sensitive coastal area. The public does not currently have a legal right to go onto these lands, but can view them from the Santa Barbara Ranch fence line (to get there, park on Dos Pueblos Canyon Road by the southbound 101 on-ramp and follow the trail around the gate and onto Langtry Avenue and over the railroad tracks, then veer left/east toward the fence line) or from the Seals Trail). In another part of the Naples Townsite, a different developer is proposing development on lot numbers 66 and 69, relying on the 2008 Santa Barbara Ranch project preliminary approval that has not been finalized by the County or reviewed by the Coastal Commission. The developer has proposed to build two large homes on a bluff-top lot and a lot north of the railroad. This application remains incomplete, and will likely need an EIR before any development can be considered. If you are interested in visiting the Naples area, the public can legally access Santa Barbara Ranch, with the exception of lots 66 and 69, by parking on Dos Pueblos Canyon Road by the southbound 101 on-ramp and following the trail around the gate and onto Langtry Ave. and over the railroad tracks down to the beach. The Seals trail also offers access from the fence along the southbound side of the freeway, across the railroad and west to the beach access path. Views of the Paradiso property are available from both Langtry Ave. and the Seals Trail, but the public cannot legally access the property itself. The genesis of the GavPlan began in 1999 with the initiation of the National Park Service study of the creation of a National Seashore on the Gaviota Coast, https://www.nps.gov/pwro/gaviota/. While this study found that the Coast was suitable for inclusion in the National Park system, George Bush and local landowners felt otherwise and the creational of a National Seashore on the Gaviota Coast died a contentious death in 2004. The opposition to the National Seashore formed around the “Common Ground” process, a process led by landowners that failed to find much common ground in a series of boisterous meetings, but did agree on the concept of “local control” as the fundamental organizing principal. As the Common Ground process was proving to be fruitless, a group of its members and stakeholders formed the Study Group in 2001. The 14 members of this group meet twice a month for a number of years, ultimately issues a report “Respecting Our Heritage, Determining Our Future” in the fall of 2005, http://ocpc.msi.ucsb.edu/pdfs/GCSG.pdf. The report offered a comprehensive plan for the long-term preservation of the Gaviota Coast and its agricultural productivity. This report fell on deaf ears at the Board of Supervisors under the leadership of Brooks Firestone. Doreen Farr, an advocate of the Study Group process, replaced Brooks Firestone and in 2009 initiated the Gaviota Planning Advisory Committee (GavPAC) to prepare an updated to the local coastal plan. The Committee produced a balanced plan offering a fair compromise on environmental, agricultural, public access, and development issues. It should serve the public well in the coming decades.